After missing last game with a left thigh injury, Jimmy Butler will be back in the lineup when the Bulls host the Washington Wizards on Monday while seeking a sixth straight victory. 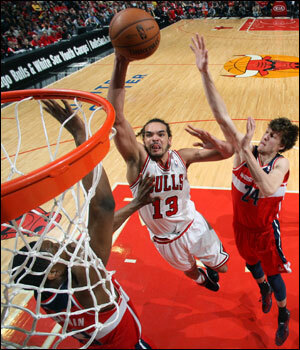 The Bulls are 8-1 against the Wizards in their last nine matchups at the United Center. And while Washington is 16-19 overall, the Wizards have proven to be a formidable team on the road, where they’ve won six of their last eight games. Chicago has size as well and its depth has been restored with healthy bodies back in the lineup, in addition to the recent signings of D.J. Augustin and Cartier Martin. Joakim Noah is another healthy body the Bulls are happy to have on the floor. After missing most of training camp and the preseason, Noah has played in 34 of Chicago’s 35 games, with perhaps his best stretch of the season coming as of late. In his last six games, Noah has recorded 12.5 points, 13.2 rebounds, 5.7 assists, 2.17 blocks and 0.83 steals in 34.5 minutes. Following Saturday’s win over Charlotte, Noah spoke at length about the state of the team following the trade of Luol Deng, what it means to play for the Bulls, and his mentality moving forward. On Monday, his focus was squarely on the Wizards. Noah is encouraged by an opportunity for the Bulls, currently fifth in the Eastern Conference, to get back to .500 for the first time since Nov. 24. It would have been hard to envision such a scenario without Noah’s leadership. Thibodeau said he strives to have a “team of leaders,” but acknowledged the extraordinary job Noah has done in that department recently. It didn’t take long for Cartier Martin to show what he can do, as the small forward who joined the team on Friday after signing a 10-day contract scored 11 points on 4-5 shooting, including 2-2 from long range, in 26 minutes against the Bobcats on Saturday. Earlier this season, Martin appeared in 25 games (two starts) with the Hawks, averaging 6.6 points on 40.3 percent shooting from the field, including 40.5 percent from downtown, and 2.0 rebounds in 17.5 minutes. Thibodeau said he watched Atlanta play and liked what he saw in Martin. Thibodeau on Monday morning shared a brief update regarding Derrick Rose.